With our beautiful beaches and fabulous weather … what a great opportunity for yoga on the beach, on the deck at your villa or in Glow’s Studio! Imagine yourself doing long holds out on Grace Bay Beach with the ocean as your background and only dip a way for a little refresh. Enquire about our private or semi-private classes … or maybe even a family class! Longtime resident of the Turks and Caicos ~ Lizzie Foster ~ feels fortunate to call this beautiful island her home. Having practiced for many years and with the completion of her 200hr teacher training at Asheville Yoga Centre , Lizzie is excited to share her passion and knowledge with others. Bringing enthusiasm and openness to her classes, she encourages her students to adopt an attitude of self-exploration and awareness. Offering vinyasa, power flow and yin classes for all levels , Lizzie relishes the opportunity to adapt classes to the individual , welcoming feedback and allowing for personalized adjustments. For her, the role of the teacher is not merely to impart her own knowledge but, as stated by one of her favorite authors Khalil Gibran, to ‘lead one to the threshold of their own mind’. Nancy comes from athletic inspired training programs including FitFlow, and most recently Power Yoga for Sports. She does longer holds to really give the muscles a chance to release, expand and change. It really is a style for all different flexibility levels but especially those that say I can’t do yoga. It is not always about finding yourself but about improving your well being, flexibility and strengthening your inner-athlete. If you want a real break Nancy is also a practitioner of thai yoga [ more details ] … you relax and Nancy does all the work. 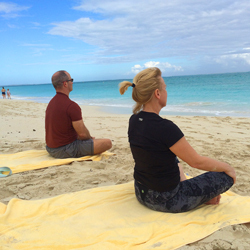 Just a quick note of thanks for 3 days of great yoga on the beach during our spring break stay on the island. We loved your spirit and passion, thanks so !!! Lizzie ~ Thank you so much for traveling out to our villa to share yoga with us. I really appreciate you being so patient and accommodating with my friend’s mobility issues. She has been nervous to try yoga and I think it was great for her to see how it can be modified to accommodate all types of people and concerns. Everyone commented on how it was the perfect beginner session for them.